TOPSTAR PLC lamp has been designed and engineered for demanding commercial applications. 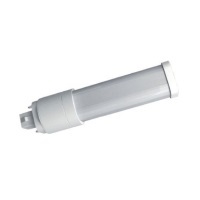 This UL classified lamp requires magnetic ballast runs directly or bypassing the ballast during installation and runs directly off line voltage to eliminate compatibility problems, incidental power loss, lifetime issues, and maintenance costs associated with ballasts. The base of the lamp can be rotated 300° to fit any socket configuration. Simply install in your existing fixture and turn ON the savings.